For the salsa, combine all the ingredients in a medium bowl. Mix well and adjust the seasoning with salt and pepper as needed. Set aside and let flavors meld. Rinse fillets under cold running water and pat dry with paper towels. In a shallow baking dish, add salt, lemon pepper seasoning, achiote powder and lemon juice. Add the fillets and cover with plastic wrap, place in the refrigerator and allow to marinate for 25 minutes. Combine the cornmeal and remaining spices in a shallow pie plate. Heat the oil to medium in a large cast iron skillet. Remove the fish from the refrigerator. Shake off excess marinade and dredge the fillets in seasoned corn meal. Fry in the hot oil until fish is golden brown, about 3 to 4 minutes or until fish easily flakes when tested with a fork. Drain on paper towels. 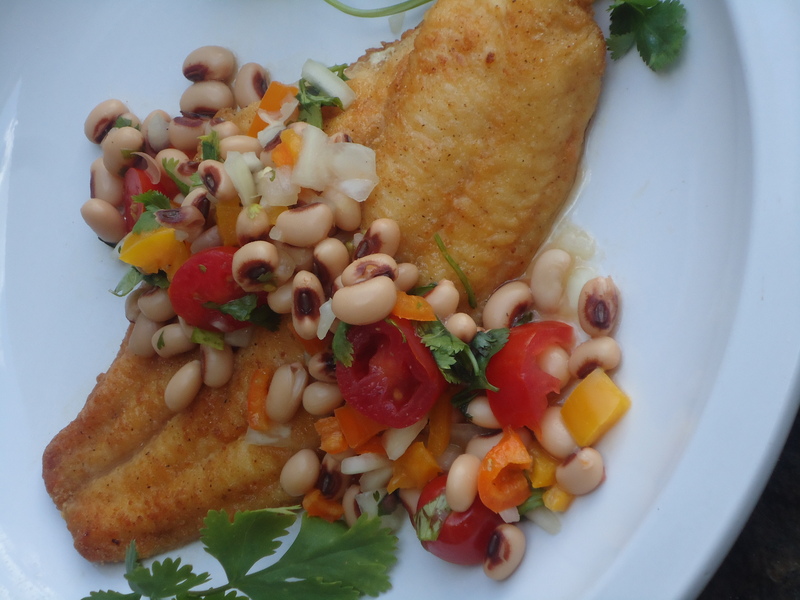 To serve, place the fillet in the center of plate and spoon the black-eye pea salsa on top. This entry was posted in Main Dishes, Seafood, Vegetables and tagged Black-eyed Peas, Catfish, Cilantro, Salsa. Bookmark the permalink.